The Knight’s Tour is a mathematical puzzle that has endured over 1000 years. 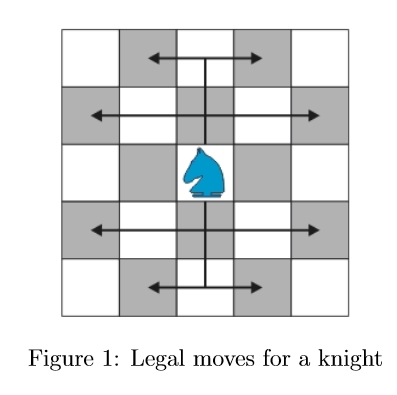 The question is simple enough – a knight (which can move as illustrated above) wants to visit all the squares on a chess board only once. What paths can it take? 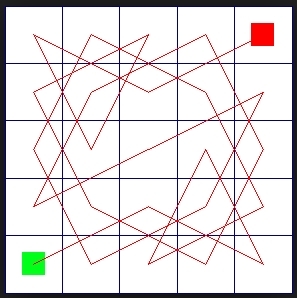 You can vary the problem by requiring that the knight starts and finishes on the same square (a closed tour) and change the dimensions of the board. The numbers refer to the sequence of moves that the knight takes. So, in this case the knight will start in the top right hand corner (01), before hopping to number 02. 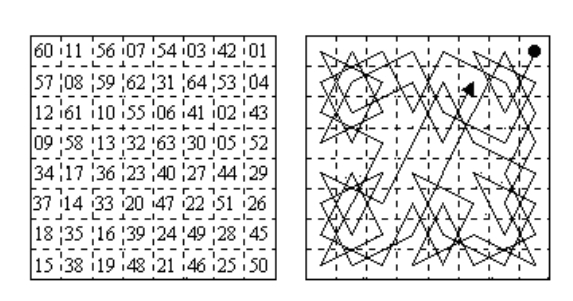 Following the numbers around produces the pattern on the right. This particular knight’s tour is closed as it starts and finishes at the same square and incredibly can be dated back to the chess enthusiast al-Adli ar-Rumi circa 840 AD. You might be wondering if this has any applications beyond being a diverting puzzle, well Euler – one of the world’s true great mathematicians – used knight’s tours in his study of graph theory. Graph theory is an entire branch of mathematics which models connections between objects. 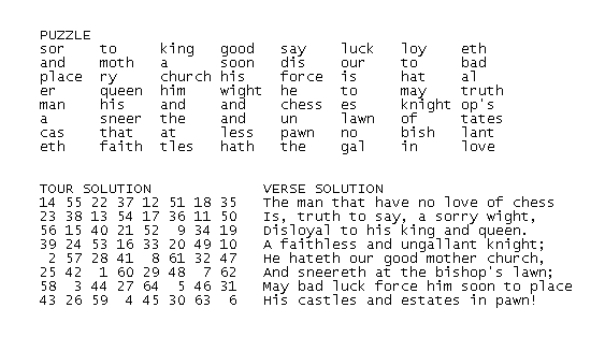 This code is from the 1870s and exploits the huge number of possible knight’s tours for an 8×8 chess board. You would require that the recipient of your code knew the tour solution (bottom left) in advance. With this solution key you can read the words in order – first by finding where 1 is in the puzzle (row 6 column 3) – and seeing that this equates to the word “the”. Next we see that 2 equates to “man” and so on. Without the solution key you would be faced with an unimaginably large number of possible combinations – making cracking the code virtually impossible. e’s are good – He’s Leonard Euler. A discussion about the amazing number e and Euler’s use of graph theory. Sierpinski Triangles and Spirolateral Investigation Lesson Plan. A lesson to introduce the mathematics in art and fractals.